Uppsala, Sweden—June 8, 2017—IAR Systems® is proud to announce an extension of its tools offering for safety-related software development with the launch of a functional safety edition for IAR Embedded Workbench® for Renesas Electronics’ RH850 Family of automotive microcontrollers (MCUs). 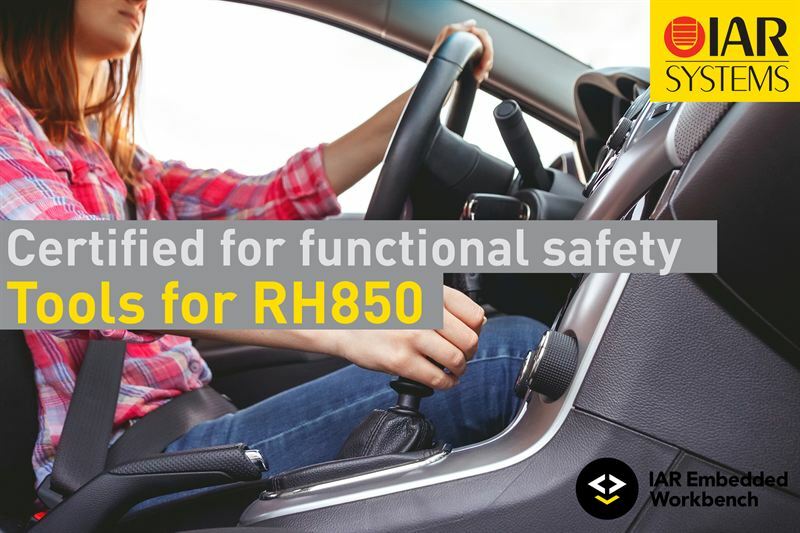 The functional safety edition is certified by TÜV SÜD according to the requirements of IEC 61508, the international umbrella standard for functional safety, as well as ISO 26262, which is used for automotive safety-related systems, and the European railway standard EN 50128. Functional safety is one of the most important features in embedded systems today, especially within the automotive industry. To ensure functional safety and meet high-integrity standards, developers need to provide extensive justification for selecting a particular development tool, unless the tool is already certified. The proof of compliance for the tools increases cost and time of development. To solve this problem, IAR Systems provides certified editions of the C/C++ compiler and debugger toolchain IAR Embedded Workbench, now also available for Renesas’ RH850 automotive MCU Family that offers high performance balanced with low-power consumption over a wide and scalable range of products supporting high reliability requirements. The certification validates the quality of IAR Systems’ entire development processes, as well as the delivered software. The quality assurance measures applied by IAR Systems and the included Safety Manual allow customers to use IAR Embedded Workbench for Renesas RH850 in safety-related software development for each Safety Integrity Level (SIL) according to IEC 61508 and each Automotive Safety Integrity Level (ASIL) of ISO 26262 without further tool qualification. The functional safety edition of IAR Embedded Workbench for Renesas RH850 includes a functional safety certificate, a safety report from TÜV SÜD and a Safety Manual. With the certified tools, IAR Systems provides a Functional Safety Support and Update Agreement with guaranteed support for the sold version for the longevity of the contract. Along with prioritized technical support, the agreement includes access to validated service packs and regular reports of known deviations and problems. In addition to the functional safety edition of IAR Embedded Workbench for Renesas RH850 MCUs, IAR Systems offers functional safety tools for ARM®, and for the Renesas RX and the Renesas RL78 Families of MCUs. More information is available at www.iar.com/safety. Editor's Note: IAR Systems, IAR Embedded Workbench, IAR Connect, C-SPY, C-RUN, C-STAT, IAR Visual State, visualSTATE, IAR KickStart Kit, I-jet, I-jet Trace, I-scope, IAR Academy, IAR, and the logotype of IAR Systems are trademarks or registered trademarks owned by IAR Systems AB. All other products names are trademarks of their respective owners.